The Saturn Junkyard: A boy and his dragon. This is a review wrapped in a story. It’s simple, honest, nostalgic and has at least one dragon in it. Before my teen years and the rise of the internet, getting news or reviews on video games came from friends around the playground, television commercials and of course magazines. Whenever my mom went to town for groceries I’d go just to read up on the latest video game news. When the September 1998 issue of Expert Gamer magazine came out I had no idea the impact it would end up having on my life. The cover featured Mega man Legends, Parasite Eve, F-Zero, and other assorted “note worthy” games. These weren’t what got me in the end, for you see on the back cover was a cut out mask. 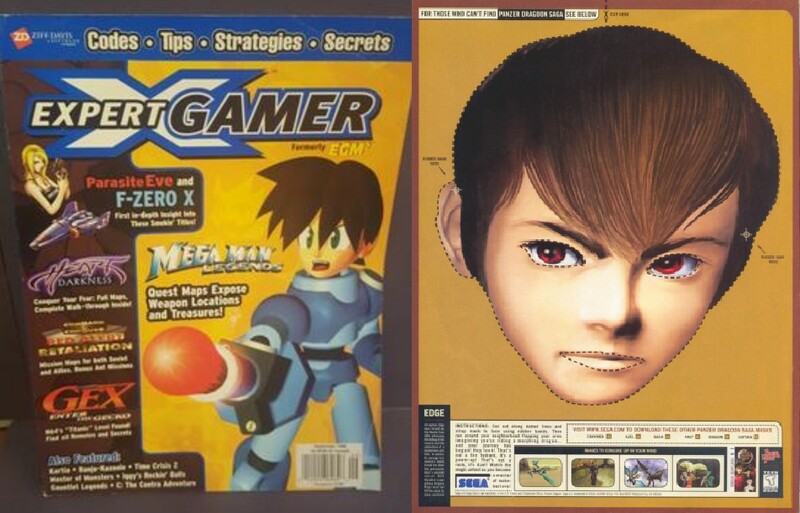 To advertise Panzer Dragoon Saga SEGA had a magazine advertisement of Edge’s face as a cut out mask. I was interested in knowing more about this new SEGA game. Fortunately this very issue had a review inside. Though small in length these four mini reviews were enough for me, I was sold. “I must play this game.” I though, but how? I’d never seen a Saturn in person before. One day I’d make it happen. The more I played the more the dread subsided. The more I engaged with enemies the more depth I discovered in battles. 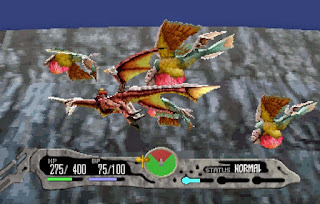 Flying atop my dragon felt awkward and clumsy at first even with the 3D control pad. By the end of the first disc I had a better understanding of the controls, heck I even started to appreciate them. I held firm to my childhood expectations, though I’m happier knowing I waited till I was an adult to play this game. As a kid or teen I probably would have got to disc 3 got stuck and gave up. With the way the story is set up, layered and presented to you, it’s easy to get lost in the game play or overlook a seemingly small detail that will hide something from you for the rest of the game. 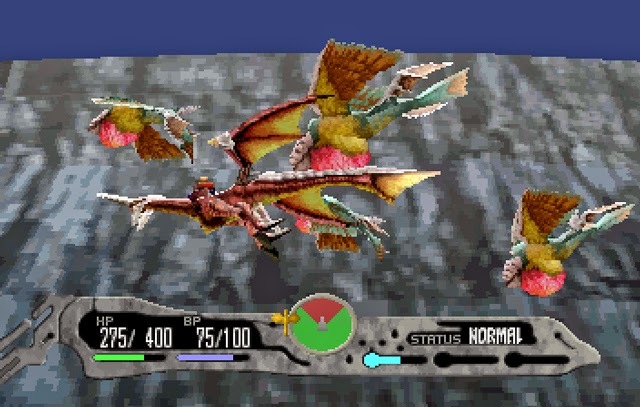 Panzer Dragoon Saga is a game where you get out of it what you put in. If you speed run or focus only on what you need to, you could finish in 9-18 hours. You could also explore every corner, talk to every living being and fight every monster for that 100% play through. That’s both this games strength and weakness. That’s why I’ve replayed it and will keep replaying it. Team Andromeda packed this game with detail, action, personality, thought and balance. Keeping true to their vision of what this game was to them. Over four discs you’ll never feel like the story is rushed or ever distracts from the game play. What starts out as a tale of vengeance, will mature into a story of a hero who will change the world forever. A blending of both fantasy and technology themes help not only with giving a great environment for the main story, they also help tell an underlying narrative. This is one of if not the best looking 3D Saturn game. All the areas fit the style and tone of the game. At times you’ll fly and watch the world render before your eyes. 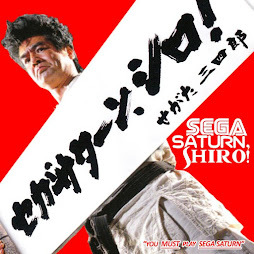 This is a hardware limitation of the Saturn and considering the how the development team handled these limitations I will overlook some flaws. Keep in mind though good for the Saturn, in 1998 there was better looking games and time can be cruel. Keep an open mind. The music of Panzer Dragoon Saga is haunting, charming and perfectly fitting. You may even find some songs stuck in your head. The monsters screams, cries and great sound effects make them seem more believable. Plus the amount of spoken dialogue was unheard of for the time and still is! At times you’ll fly your dragon through open environments exploring the world, for the most part these sections are great. Using a target to explore though true to the Panzer series can this game feel like it’s a point and click adventure. Now the battle system is an interesting one, you have the ability to circle your enemy for either a good opening to attack from, or a safe place they can’t attack you from. Your enemy can also circle you. You can also customize your dragons stats at any time by “morphing” him or changing it’s appearance, granting you certain bonuses. Even though you could, should and will replay this game. I feel the average gamer will play it tops three times and shelf it. Personally I’m going to play it a couple more times before I put it on my self to be played yearly. I’d say for myself, it’s been quite the journey and experience. At the end of the day I got the value from this title that I expected. 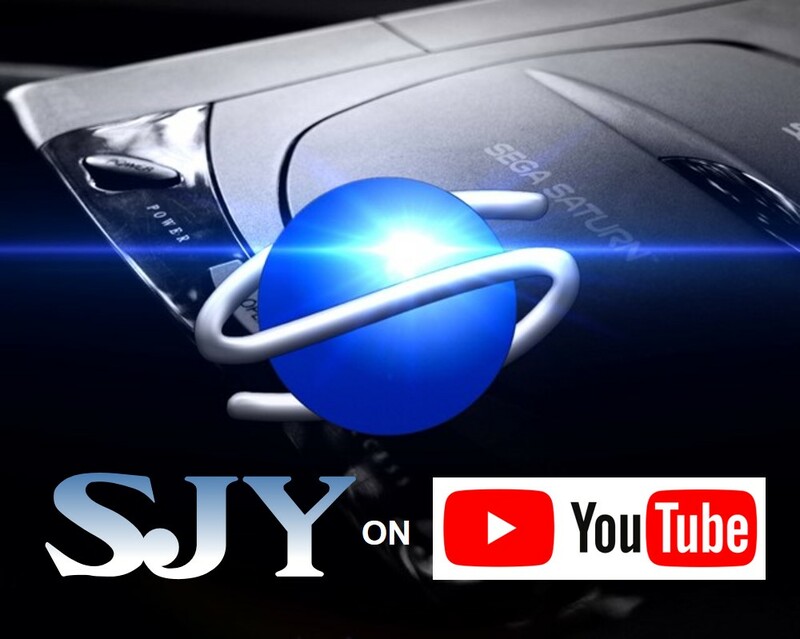 I wish I could have bought it new in 1998 or at least from SEGA so they could have benefited from my purchases, seen that I cared and appreciated their efforts. It’s hard to believe that it’s been 20 years since this game came out. Also That in those 20 years nothing quite like this game has been made. 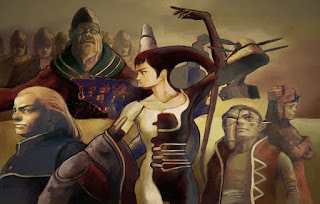 If you are an RPG fan and you want a fresh experience unique to SEGA and Saturn, you owe it to yourself to play Panzer Dragoon Saga. If you are a huge SEGA fan and want to try an arcadesc RPG with shooting elements and morphing dragons play this game. If you want a game or story that feels like Mad Max meets Dragon Heart meets Afro Samurai you should play this game. You should probably avoid this game if you want a quick fix, lack the time to invest into it, or can’t stand RPG's. 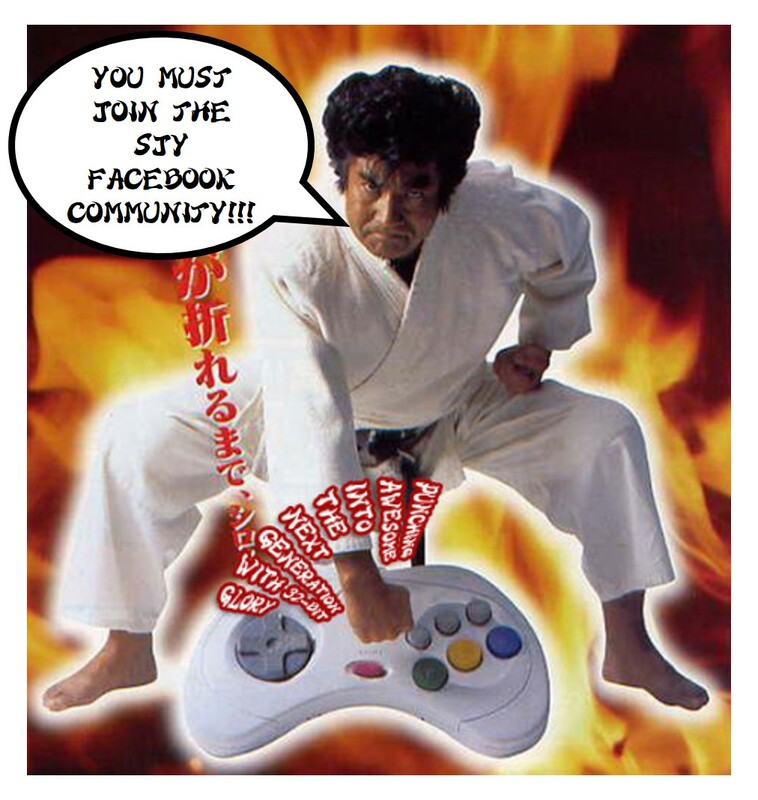 I don't think anyone could've said it better, PDS is the shining jem of the Sega Saturn. Sometimes you do have to play a game at the right time to appreciate it. Thank you for your reply, I totaly agree. Just like tastes in books or movies refine as you age, so too do video games. I wonder what "new" experiences I'll have with classic games. The point in the game that 'did it' for me was when I returned to the sunken ruins of Uru at sunset. It felt incredibly majestic and yet, isolated. I was alone. I knew that the sun was setting on the cilivisations of the Panzer world, much like it was for the Saturn itself. Change was coming... and yet, nothing would be so beautiful as flying around Uru, all alone atop an ancient dragon, at sunset. I FELT that. I WAS there. That's when I knew this game was a masterpiece. Great review, this game is the reason why I love JRPGS. Saga changed my life and the only game I could say I love more is Shining Force III. Still Saga has my favorite characters, soundtrack, art style and battle system in any video game. A true masterpiece. That's such a deep and personal experience, thank you for sharing it with me. Thanks, I'm glad you enjoyed my review. I can't wait to finish Shining Force 3. It's a challenging game but the time seems to just fly by as I play. I had the game back in 1999 when it was first released. Twenty bucks at Toys R Us... you can't beat that with a stick! 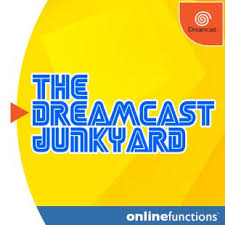 It was a refreshingly different role-playing experience, but a year later after I bought my Dreamcast, I just couldn't go back to it. It aged so very badly. 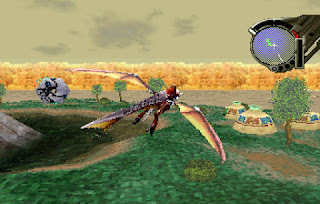 The writer claims that Panzer Dragoon Saga has some of the best 3D graphics on the system, but if that's the case it doesn't reflect kindly on the Saturn hardware. I can't think of a game more deserving or more desperately in need of a next generation remake... unfortunately, the last PD game we got was Orta on the Xbox, and it doesn't look like Sega is interested in going back to that well. 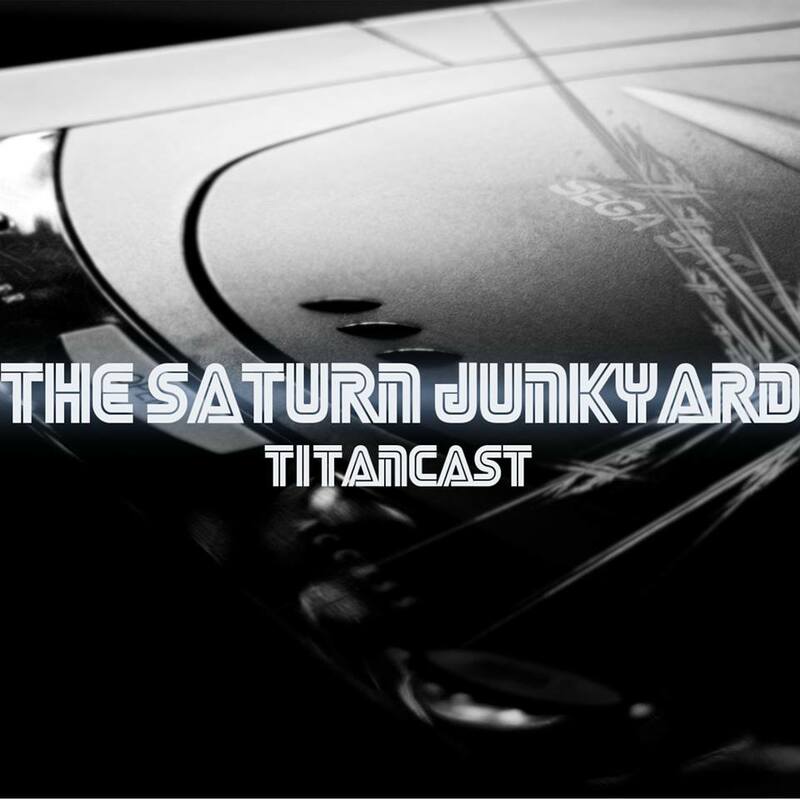 An outstanding article as your debut as a fully fledged membervof the Junkyard team! You even make me tempted to try it again! Halloween 2018 on the Saturn!